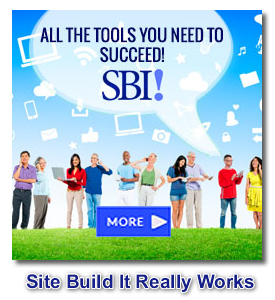 Have you heard about Site Build It or SBI? Sitesell's SBI is a combination website hosting and online business building package that makes successful global marketing for small business do-able and within reach of every individual or small business owner, wherever you are. Site Build It (also known as SBI) is the core product of SiteSell, a company that specialized in enabling individuals and small businesses to succeed online, whether you want to build an online business yourself or pay them to build a website for you. I personally have opted for the DIY choice and have used SBI for nearly a decade now to build, maintain, and grow my online business. If you are a small business owner and can't be bothered with the mechanics, their Sitesell Services professions can be hired to build you a site that enables you to establish your brand globally, generate new leads and help you to convert them to customers. With SiteSell Services and SBI you will get a site that serves as a buffer against economic downturns, recessions, and low business cycles. SiteSell has helped tens of thousands of folks build web sites that work since 1997. Numerous offline entrepreneurs, service sellers and local businesses have expanded their market thanks to SiteSell's flagship product Site Build It. Most webmasters merely "put up" sites. They may be beautifully designed sites but they do not build traffic (targeted visitors). SiteSell's SBI websites are different. Sitesell teaches you exactly how to build a site that ranks well in the search engines so that you aren't like a voice crying in the wilderness. You actually get people visiting your website to see what you have to offer, whether information, products, or services. As you add more business-related content to your site, visitors will start to build trust in you and your business. That credibility is essential for visitor conversion. As you see this work, with SBI you will truly "get the Net." Would you rather not do-it-yourself? If not, consider hiring one of the Sitesell Services Professionals to build your small business website for you. Sitesell is able to provide turn-key web sites that produce results. Their specialists build top-quality, high-traffic web sites in an organized, professional manner and at a surprisingly competitive price. They will create for you the foundation and framework of a web site that pleases both human visitors and the search engines, sending you the visitors that your small business needs to go global. SBI reviews that confirm SBI sites work. SiteSell Services helps you continue to develop that growth to become prominent and successful in your particular niche on the Net. SiteSell Services use the proven CTPM Process (Content - PREsell - Traffic - Monetize) to build you a content-packed site which works to bring traffic to your site. That traffic can then be PREsold on your recommendations, suggestions and offerings and this "warmed up" receptive reaction ultimately leads to monetization. CTPM is the core that sets SBI and SiteSell Services apart from other website providers and systems. In business, the right partner is vital. SiteSell Services will work side by side with you, personally and professionally, to produce optimal business results. Specialists work efficiently, using the powerful combination of a proven process and a comprehensive suite of advanced site-building tools. Productivity benefits are passed on to you, leaving you with more money (and time!) for other parts of your business. Websites that are Powered by Solo Build It mean sites have been developed with the CTPM process in mind and the goal to deliver quality content and reliable service.